Oh boy, it’s frozen pizza night…except the oven won’t fire up. 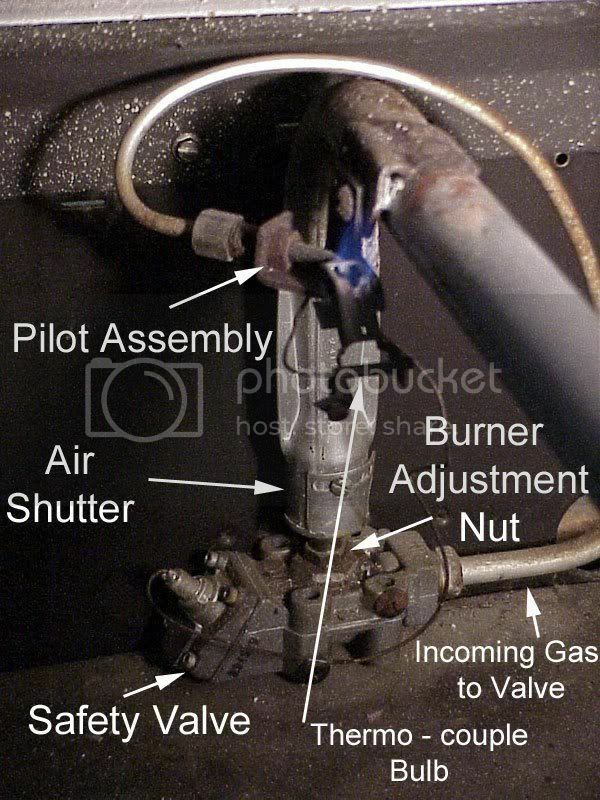 If your gas oven isn’t firing up, the first step in fixing it is figuring out what type of ignition system you have. This Appliance Tip of the Day will ‘splain all that to ya. Click the links for pictures of each type. The ignition used on your range will be one of these two types. What’s the difference? Hang with me a moment and I’ll ‘splain it to you. Hot surface ignition systems use what’s called an ignitor. Common flat ignitors look like this. The heart of an ignitor is the carborundum material at the end. That’s the gray part, usually in a protective cage, attached to the ceramic base. The carborundum is a very fragile material that gets very hot and glows bright orange when you run a electrical current through it. The carborundum can also be round but most are flat. 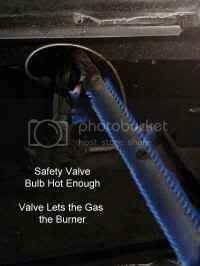 The ignitor is wired in series with a special part of the gas valve called the bi-metal. As the ignitor heats up, it’s resistance drops allowing more current to flow through it and on to the bi-metal in the gas valve. As current flows through the bi-metal, it heats up, too, and it’s designed to bend. When the bi-metal bends, it opens the port allowing gas to flow through. This gas flows to the oven burner tube and out some special holes drilled in tube right next to the ignitor. Since the ignitor is really hot, the gas bursts into flames, igniting all the gas in the burner and you happily go about your bidness of baking a frozen pizza. As these ignitors are used, they develop little itty bitty cracks in ’em that increase the resistance of the carborundum. Eventually, the carborundum won’t pass enough current to open the bi-metal in the gas valve so no gas ever squirts out. So, the only way to really know whether the ignitor is bad or not is to measure the current flow through the ignitor when you turn the oven on. Lots of gory details about that on this page. a spark lights up the pilot flame when you turn on the oven (called a “spark-assisted pilot”). If your oven is a pilot ignition system, how do you tell which type it is? Good question, grasshopper, now you’re thinking! First, look at the pilot assembly in your oven. They come in various shapes, some common ones are shown here. If you see a pilot flame with the oven turned off, then you know you have a standing pilot system. 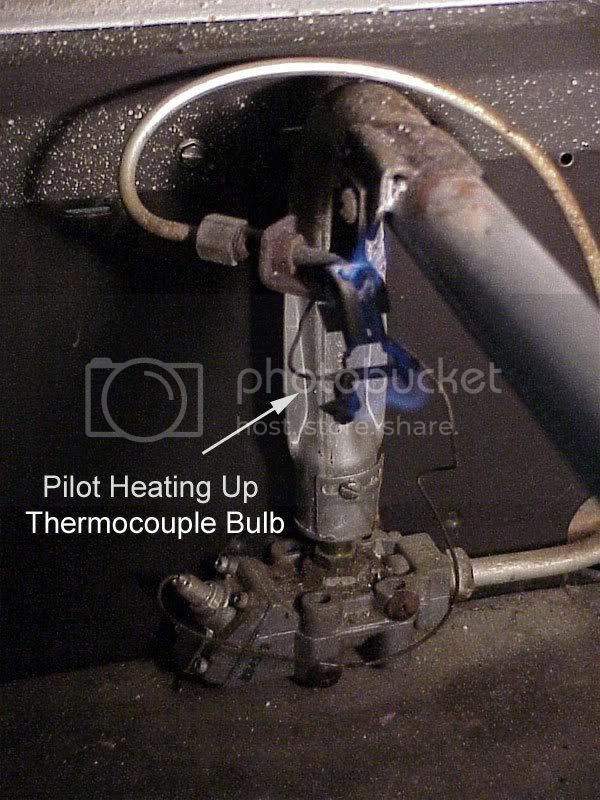 If the pilot flame only comes on when you turn on the oven, then you know you have a spark-assisted pilot ignition system. The sensing bulb may not be positioned properly in the flame. You can’t heat the bulb properly if it’s not in the pilot flame! The sensing bulb needs to live in the upper third of a pure blue pilot flame–that’s the hottest part of the flame. The sensing bulb itself may be burned out. It happens. It’s a integral part of the gas valve so, no, you can’t just change the sensing bulb separate from the gas valve. Life’s never that easy, is it? How do you tell the sensing bulb is bad? Well, figger it out by process of elimination: if the pilot flame is good and doing what it’s supposed to do, then the sensing bulb is bad. “Hey, what do you mean, ‘if the pilot flame is doing what it’s supposed to?’ I thought the pilot flame was just supposed to be a purdy blue flame.” Well, that is an important part of what it’s supposed to do, but that’s not quite all of it. The pilot flame moves around and does different things according to what’s going on with the oven. With the oven off or with the thermostat temperature satisfied, the flame just stands there looking purdy (in a standing pilot system). There could be a problem with the switch in the thermostat. You can confirm this by doing a simple continuity test of the thermostat contacts. If you don’t read zero ohms when you turn the switch on, replace the thermostat. The spark module could be bad. You’ll need to measure the voltage at the oven terminals of the spark module when you turn on the oven. If you get 120v but no spark, it’s probably a bad spark module. Replace it. Could be a bad spark wire or broken electrode. Feast your Vulcan squinties on that stuff. Maybe get real fancy and use your ohm meter to measure continuity from the spark module end of the wire to the electrode tip. Use your imagination. Go crazy…sort of. If you’re still confoosed and need more help, post your question in the Samurai Appliance Repair Forum. And, Hoss, be sure to include your model number. Awwite, go bake you some pizza!